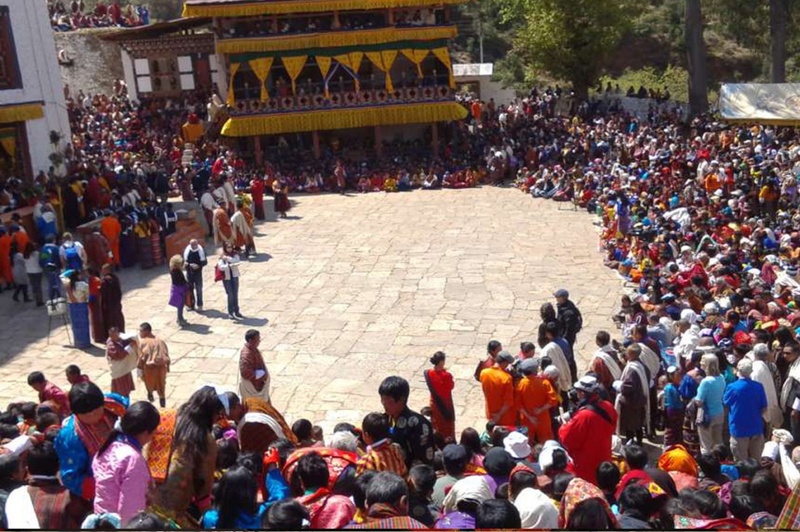 Paro Tshechu is one of the biggest festivals in the Bhutanese calendar and was started by Zhabdrung Ngawang Namgyal, and Penlop Rigzin Nyingpo during the consecration of Paro Dzong in 1644. The festival is observed in three parts – the pre-festival rituals on the first day, ceremonies on the second day inside the Paro Dzong, and the main festival at the festival ground for three days. Bhutanese from all walks of life in their finery come to attend the five-day festival. A special event in all Tsechus is the unfurling of the Thongdrol, meaning “Liberation at Sight.” This comes from the belief that seeing an aesthetically proportioned Buddhist image plants a seed of enlightenment in the viewer’s heart. That seed matures into the liberation of one’s mind and frees us from endless rebirths of suffering. Thongdrol also means large silk appliqué thangkas (painting) that are displayed for a few hours during important religious ceremonies in Bhutan. The sacred Thongdrol of Guru Rinpoche is displayed early in the morning on the last day of the Tshechu. On such occasion, the festival venue fills with people at dawn in freezing cold. The flight is exhilarating to say the least, as the route traverses parallel to the mighty Himalayas enabling passengers to see the world’s highest peak, Mt Everest, and many more. The descent affords a panoramic view of Bhutan’s foothills culminating into a thrilling landing at what is considered one of the world’s most challenging airports. After early breakfast drive to the Ramthangka (base camp) of Taktsang. The five-hour round trip follows an ancient but oft-trodden footpath flanked by water-driven prayer wheels. Day 03: Whole day witness the Paro festival. Day 04. Paro – Thimphu: Witness the festival in the morning and drive to Thimphu, Bhutan’s capital city in the evening. Overnight in Hotel. Memorial Chorten (Stupa): Your day will begin with visits to the Memorial Chorten, one of Bhutan’s most beautiful stupas built in memory of the Father of Modern Bhutan, Third King Jigmi Dorji Wangchuck. Buddha Point: The next visit will be to Buddha Point, where the gigantic Buddha Statue stands. Changangkha Lhakhang: A 13th century monastery, built by Phajo Drugom Shigpo and later embellished by his son Nyima, the monastery is believed to be the protector of all people born in the Chang valley. Others: We will also be visiting the Takin Zoo, taking a drive to Sangaygang, a point from where you can have a bird’s eye view of Thimphu valley, Handicraft’s center, the Local Bhutanese Paper making factory, a Nunnery and the Arts and Craft School. After lunch we move to Punakha, a drive of about 3 hours. In about 45 minutes, we will reach the Dochula Pass (3,100m). Tashichho Dzong: The country’s main secretariat building, built in 1642, it is today the hub of Bhutanese polity. This massive structure houses the office of the King, the Throne Room, some government Ministries and the State Monastic Body. It is also the summer residence of the Chief Abbot and senior monks. On the way visit Chhimi Lhakhang, founded by Lama Dukpa Kinley also known as the “Divine Mad Man.” It is half an hour walk across a local village and rice field. After lunch visit Punakha Dzong-built in 1637 by Zhabdrung. It is one of the most beautiful Dzongs in the country. After breakfast drive towards the north of Punakha valley and start the hike to Khamsum Yuelley Namgyal Chorten, an hour round trip. After lunch, drive to Thimphu. After breakfast, drive to Paro international airport for your onward flight. Our representative will see you off.